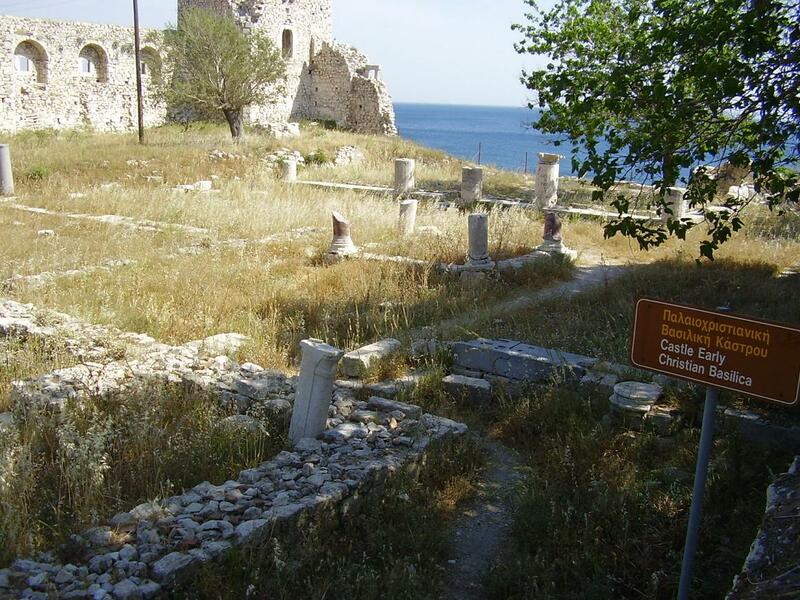 This sanctuary is one of the most famous sights of Samos and is located 6 kilometres from the village of Pythagorio. 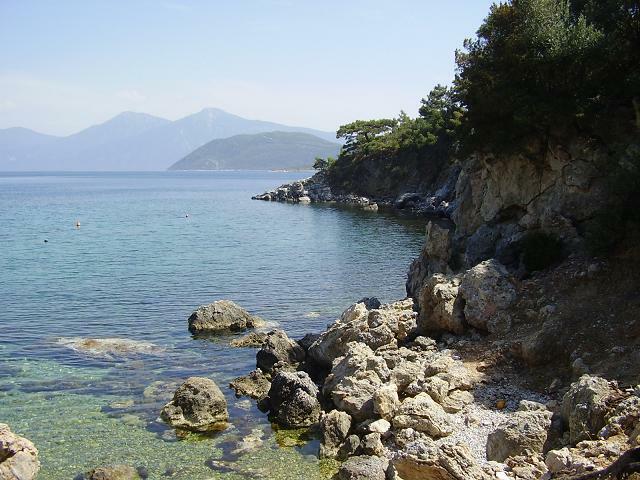 It was build because people believed that the goddess Hera (the wife of Zeus) was born on the island of Samos. The first temple was built during prehistoric times and destroyed by invaders. During the 7th and 8th century BC it was rebuild and then destroyed again by the soldiers of the King of Persia. The actual temple is the one built under the rule of Polycrates and it had to show off his power and wealth. It was built according to the Doric and Ionic order with beautiful decorations. 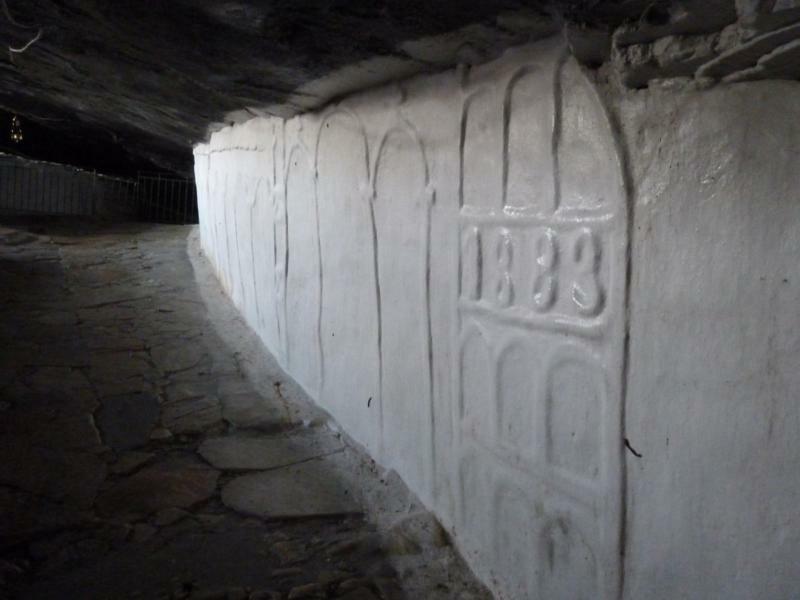 It was finished in 560 AD and it measured 105 by 52 meter. The temple had two lines of 21 columns on the long side and 8 to 10 columns on the short side. The columns were more than 20 meter high and in its time the Heraion temple was the largest temple in Greece. The statue of the godess Hera was standing in the middle of the sanctuary. 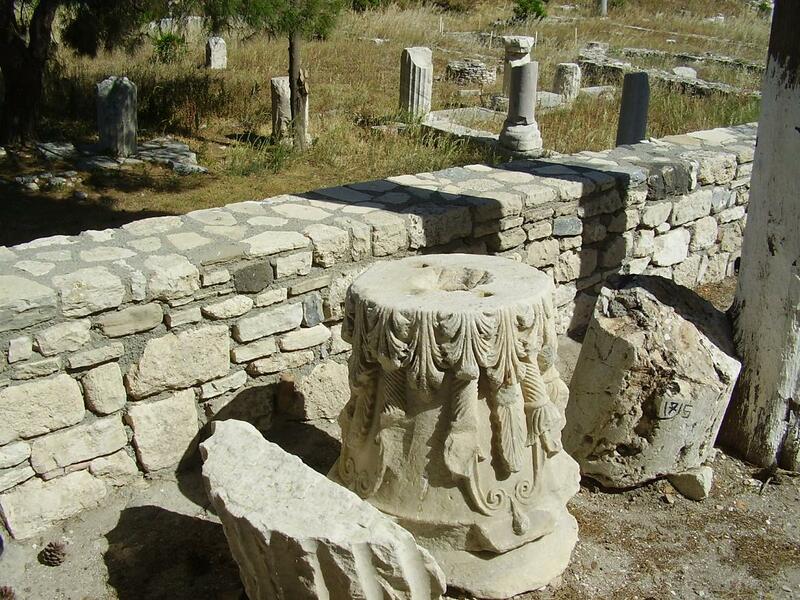 Only remains of the temple can be visited today as well as the remains of thermal baths, of the grand altar and the pavilion of a Roman temple. The whole is not as impressive as for example the Acropolis in Athens or the excavations at Delphi, because there is not really much left. The only thing that gives a bit of an impression is the only remaining column which is 10 meter high. Yet it is still interesting to have a look because of the size of the site and the fine details in the sculptured items that you can still admire in some places. For more pictures of the temple see the Ireon page. Between the sanctuary at Heraion and the capital at the time (the nowadays Pythagorion) there was a "sacred road" that was paved with marble. This road, that was leading over the Chora plain was embellished with statues and groups of statues. 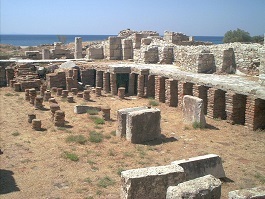 The Heraion is opened tuesdays - sundays from 8.30 to 14.00 and there is a small entrance fee. 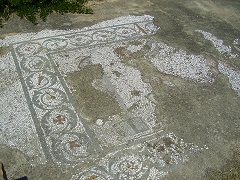 Most of the important finds, mainly very large statues of young men and women, are no longer on the site, but instead they are exposed in the Archeological Museum of Vathi. Located in the village of Pythagorion, this tower was built in the 19th century by Lykourgos Logothetis, leader of the Revolution of Samos against the Turks, in protection against the Turkish attacks. In the yard of the castle there are two Roman galleries and the remains of churches dating from the late Christian period. 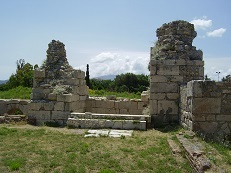 Logothetis defeated the Turks and the Metamorfosis church next to the house was build to honour the victory. 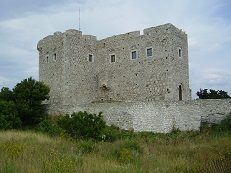 The castle was very rapidly built in 1824 on a hill and to build it the foundations and the stones were used from the old palace of Polycrates, which previously had been standing on this strategic place. On August the 6th 1824 the people of Samos "with the help of Christ" achieved a victory over the much larger Turkish army and after this they proclaimed the independence of Samos. All states in a triomph bow in front of the church. 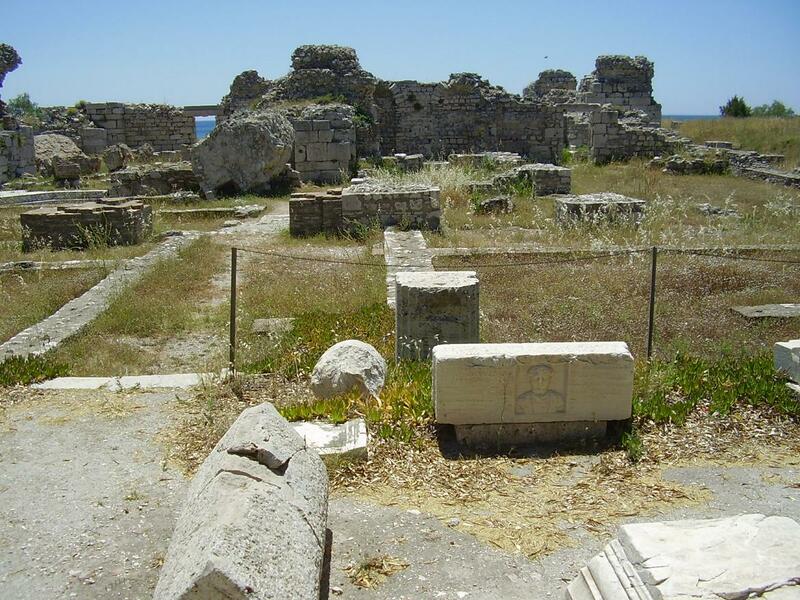 Between the church and the castle lie the village graveyard and a couple of small archaeological discoveries (remains of columns, an early christian basilica, low walls and large stones). 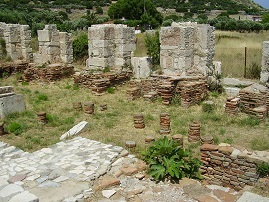 A museum with many finds from around the island of Samos. The museum houses the archaic sculpture collection, including the famous colossal Kouros. The Kouros was made during the rule of Polycrates, and everything that he undertook had to be grand and powerful. 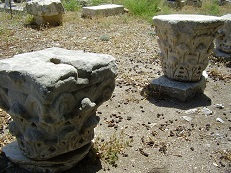 Many of the original artifacts from the Heraion are here. 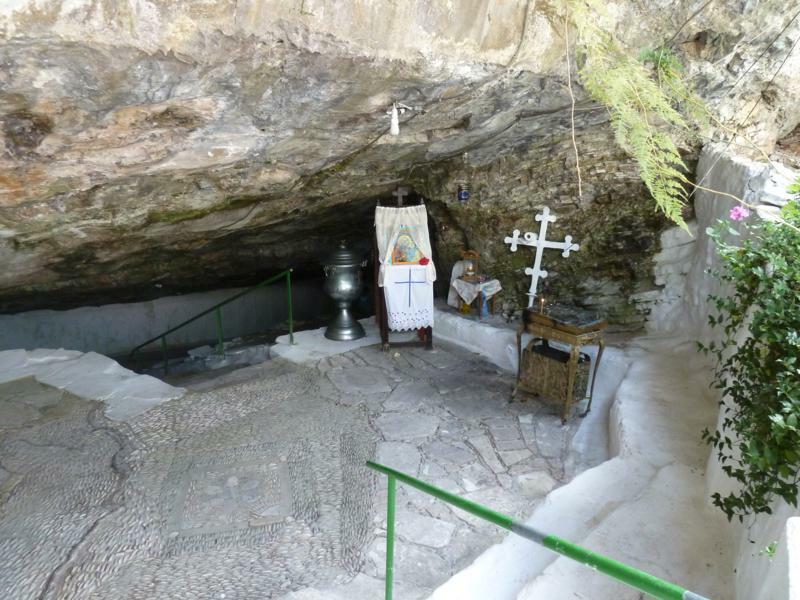 A little to the northwest of Pythagorion, on the island of Samos, there is a monastery of Panagia Spiliani (the Cave of the Virgin Mary) with 95 steps that lead down into a big cave with a church that is dedicated to the Virgin Mary. Inside this church it contains a very faded and old tiled/marble icon of the Panagia Spiliotisa. The small shrine is located at 125 meter altitude on the hill Ampelos and there is a terrace where you can order a drink or buy a souvenir. From here there is a nice view of the great coastal plain and the sea. 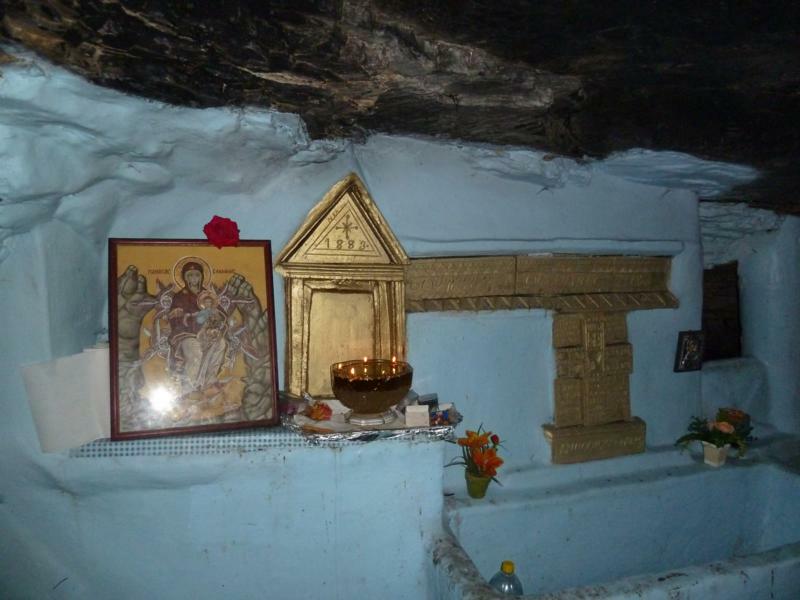 In the very back of the cave lies the small church with a number of icons that are faded and covered with a cloth. On the left side of the cave water is dripping into a bowl. This water is said to have healing powers. 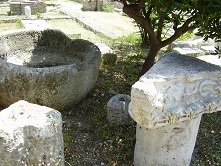 Half a mile south of Pythagorion, on the route to the airport, on the west side of the road are the remains of a large Hellenistic gymnasium. 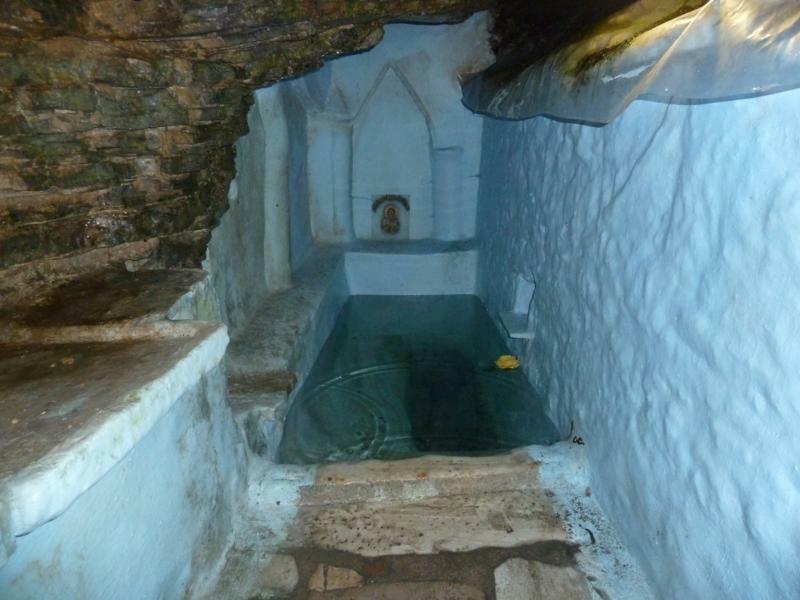 In Roman times, the western part of this was converted to a public bath. 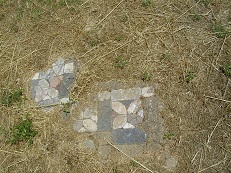 You can see low walls and marble floors and on the site are also a Roman mosaic floor and an early Christian basilica. The site is open tuesday to sunday from 9.30 (wednesday 10.30) t0 14.30 and the entrance is free. 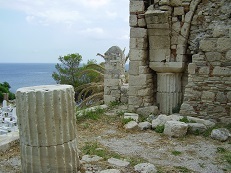 The stone columns that you see on the picture here were supports for a floor with underfloor heating. 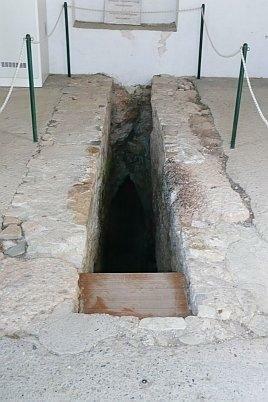 Close to the building there was a basement where servants would produce heat which was then directed under the floor. 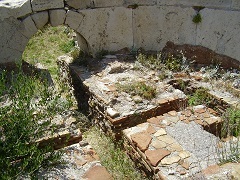 The ruins of this ancient theatre are situated in the village of Pythagorio, near the Monastery of Spiliani and are believed to be the ruins of the theatre of an ancient town which was standing where Pythagorio is today. This aquaduct is one of the most impressive works made under the rule of the tyrant Polycrates (build between 529 and 524 BC). It is a tunnel-aquaduct of a total length of 1350 metres right through a mountain, with a portal bearing an inscription built at its entrance. It was build by slaves to supply the town with water. They started digging it on two sides and then met eachother in the middle: quite an achievement. The water itself actually did not run through the tunnel but through pipelines that were situated 4 to 9 meters lower. 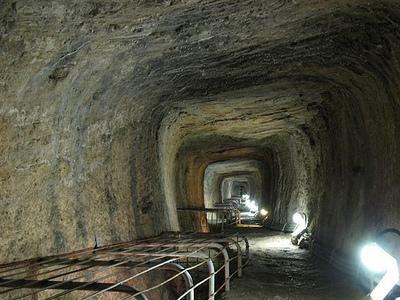 It took 5 and a half years to dig the tunnel after which they could start digging the pipeline from inside the tunnel. 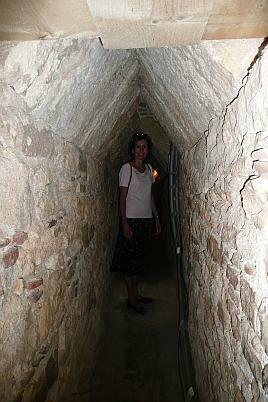 The tunnel is situated a little outside Pythagorio and it is opened to public except on mondays 08.30-14.00. 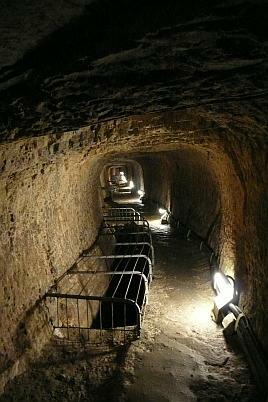 The sighs "tunnel" and "orygma" lead to the tunnel. 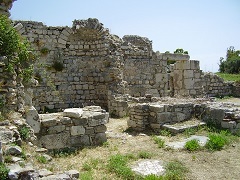 If you walk from the parking area to the tunnel of Eupalinos you will walk past the remains of city walls. The contours of the walls and how they run are clearly visible and you can recognize a few guard towers. From here you can also see a large part of the island of Samos, like the airport and the salt pans. 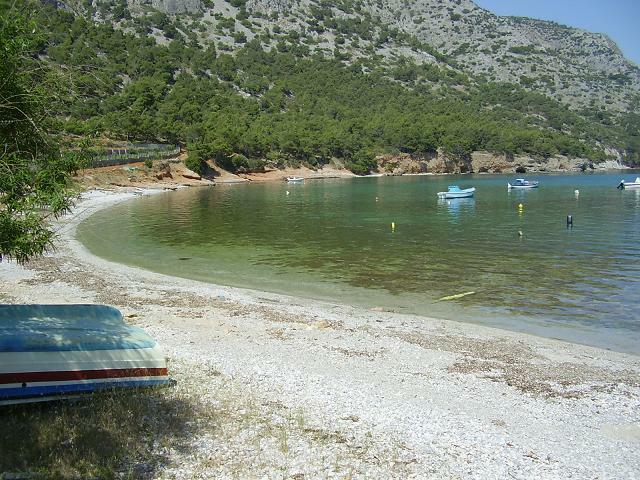 The area of Potami is located 3 kilometres west of Karlovassi and is one of the most beautiful areas of Samos. 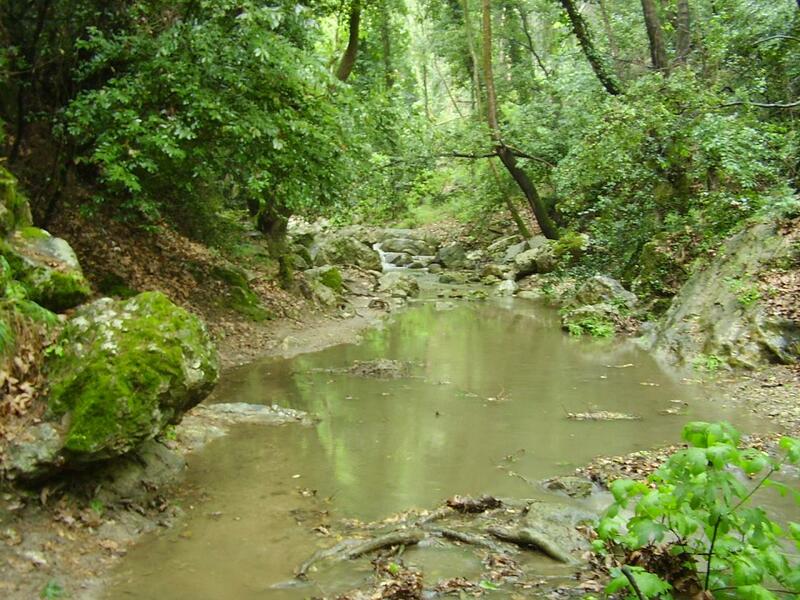 A walk along the river through the forest leads to a small lake and the Potami waterfalls. The incredible beauty of the place will enchant every visitor. 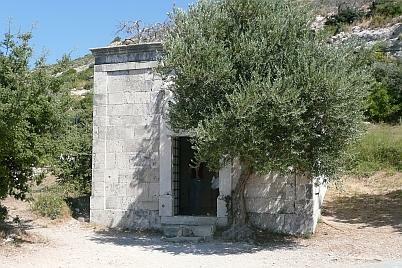 This is the refuge of Pythagoras when he was on the run from Polycrates. 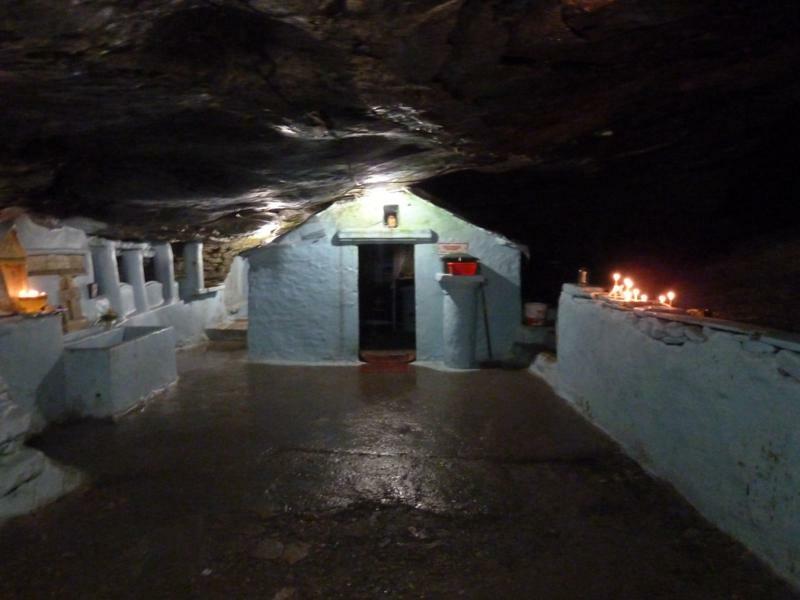 The cave is situated some 300m up from the parking area for the site by steps. A second cave has recently been opened up close to the main cave and this is said by some to be the real cave of Pythagoras. Pythagoras spend a lot of his life in exile in Italy. 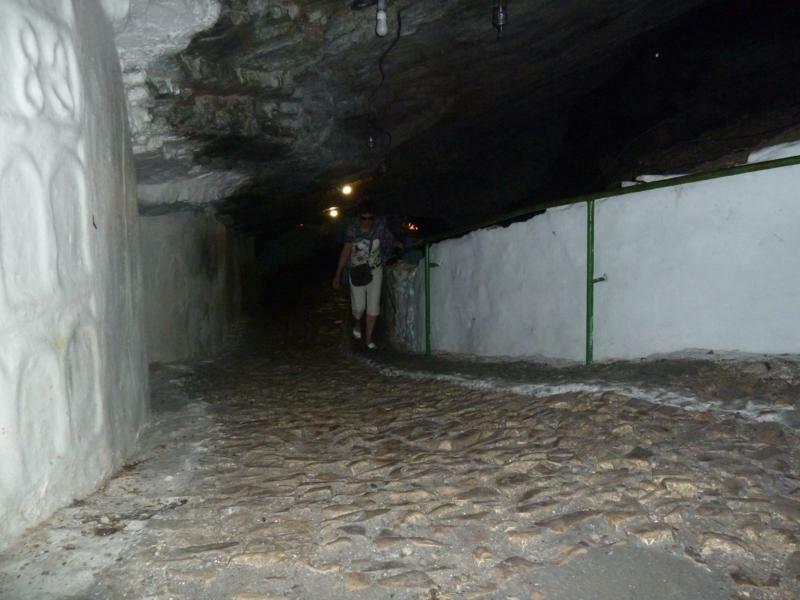 To see all the pictures of the Pythagoras Cave click here. 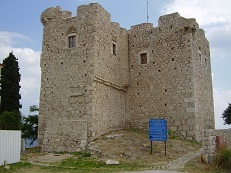 If you visit the Potami Falls and Gorge, you can make a detour to visit the remains of this small castle. 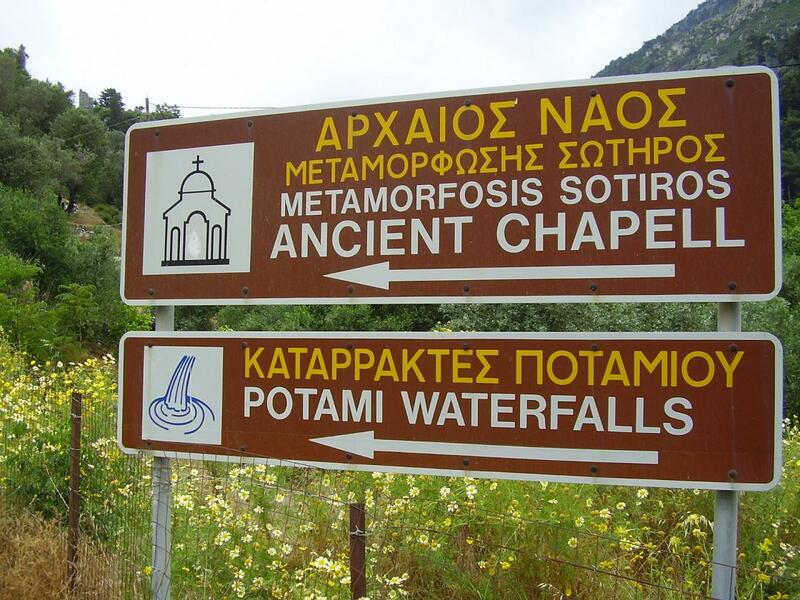 The path can be found at the side of the church (on the way to the Potami Falls) and it is clearly signposted. The way up is steep but worth the effort for the remains and the view. 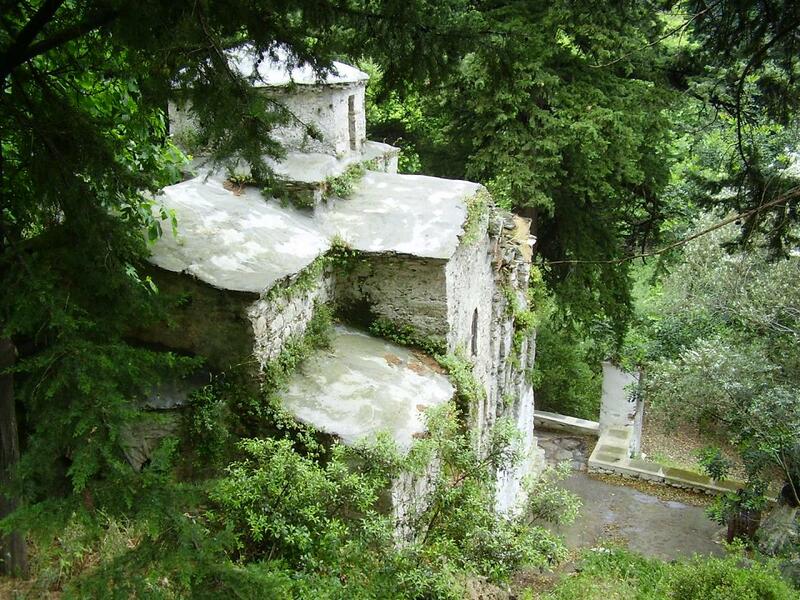 Northeast of Vathy (Samos Town) is the 18th century monastery of Zoodochou Pigi. It is set on one of the higher points of Samos, and The monastery is considered to be one of the finest on the island and is still in use. The views from the monastery are very beautiful. If you want to have a look inside the monastery be properly dressed. Taking pictures is not allowed (like almost everywhere in Greek monasteries and holy places it seems) and that put me off. I didn't even bother to go in the first time I was there, because what have I got to show to my friends and to you when I get home? Correct: nothing. The views are nice and downstairs of the mountain there are a couple of beaches. 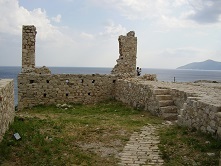 I did manage to make a few pictures of the building though the second time and you can take a look at them at the churches and monasteries in the north east of Samos page. On the north of Samos, between Karlovassi and Kokkari you can find the Valley of the Nightingales and, at the top, the village of Manolates. About one mile after turning off the main road to the Valley of the Nightingales, you will find a parking area opposite a taverna. From here you can walk around this beautiful valley. 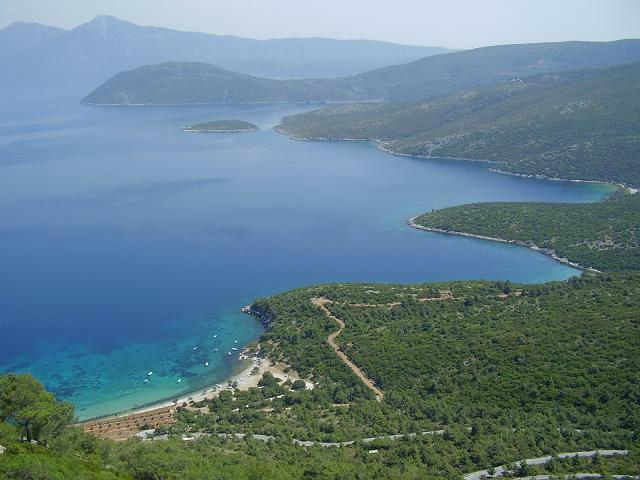 Following the coast road along from the Valley of the Nightingales towards Kokkari will allow you to visit Vourliotes and Moni Vronda. Vourliotes is an interesting mountain village. 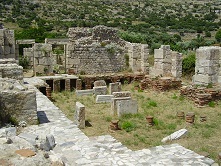 Moni Vronda is the oldest monastery on Samos. The monastery looks like a fortified building and has, like Zoodochou Pigis, incredible views over the valley. For the pictures of Vourliotes click here. The monastery of Moni Vronda (dedicated to Maria) is located in the Ambelos mountains at two kilometers distance south of the village of Vourliotes. The monastery is also accessible through a 7 kilometer long track from the center in the coastal village of Kokkari (at the bus stop). The walk is marked with red dots and runs up in curves up the slope. The monastery is situated at 480 meter altitude on the slope of the mountain Lazarus, and until 2000 it was surrounded by old chestnut trees and platane trees. 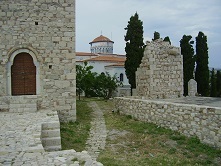 During the fires in 2000 that devastated the island of Samos both the monastery as the surrounding nature were badly damaged. The outer walls of the monastery were damaged and some parts of the walls have collapsed. The immediate surroundings of Moni Vronda is today mainly a military area and only a few soldiers now live in the monastery. After the fire the monastery was closed for the public - so check if it is open to visitors. From Moni Vronda you continue hiking in the mountains. Not far from the monastery located on top of a hill the ruins of the castle Louloudes. This castle is not easy to find. 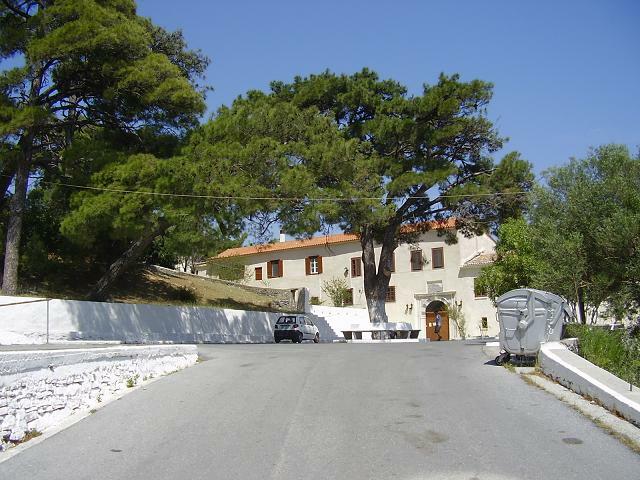 You need to walk up to the gate and then you turn left along the way, then the sign "Mytilene" and follow the highest part of the road climb. 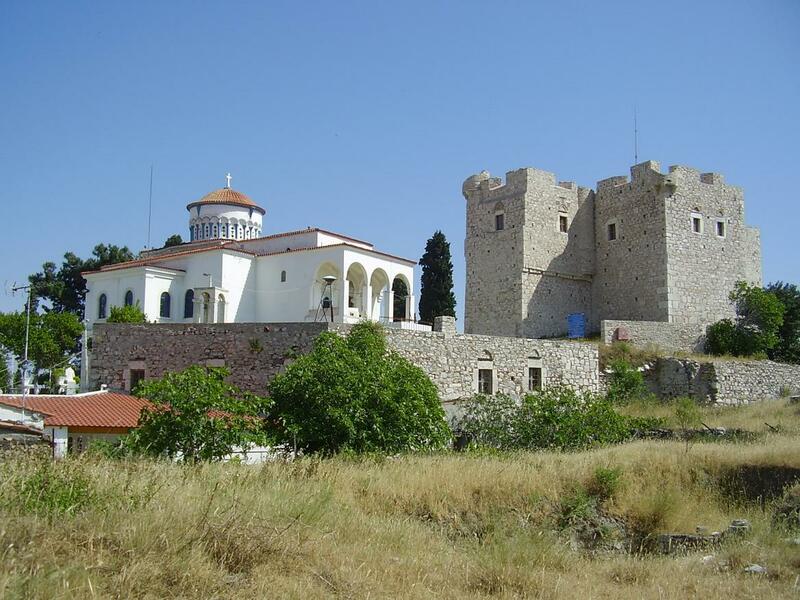 Moni Vronda monastery is the oldest monastery of Samos. It was founded in 1566 by the monks and Makarios Iakobos and takes its name from the fact that around the mountain there are often thunder storms ("vronda" is Greek for thunder). The monastery was restored to its old glory in 1960. Inside in the chuch is a a beautiful wooden iconostase with icons dating from the 18th and the 19th century. The most important one is an icon of Maria. Once the church was completely covered in frescoos but these are now in a bad state and need to be restored. From a distance the monastery with its heavy walls and towers looks like a fortress. The building is three stories high and the rooms of the monks are hanging on its walls. 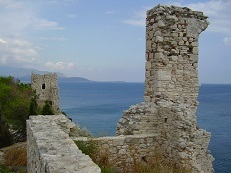 The view from the monastery is to Turkey and a part of the island of Samos. The area around the monastery Moni Vronda is very popular with walkers who enjoy the wonderful views. 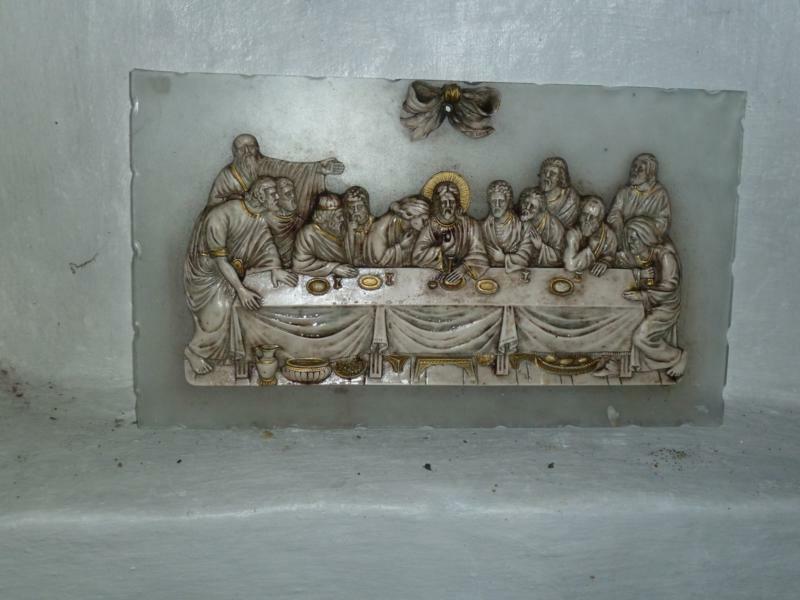 The last row of pictures are of a small church that is standing nearby the monastery. 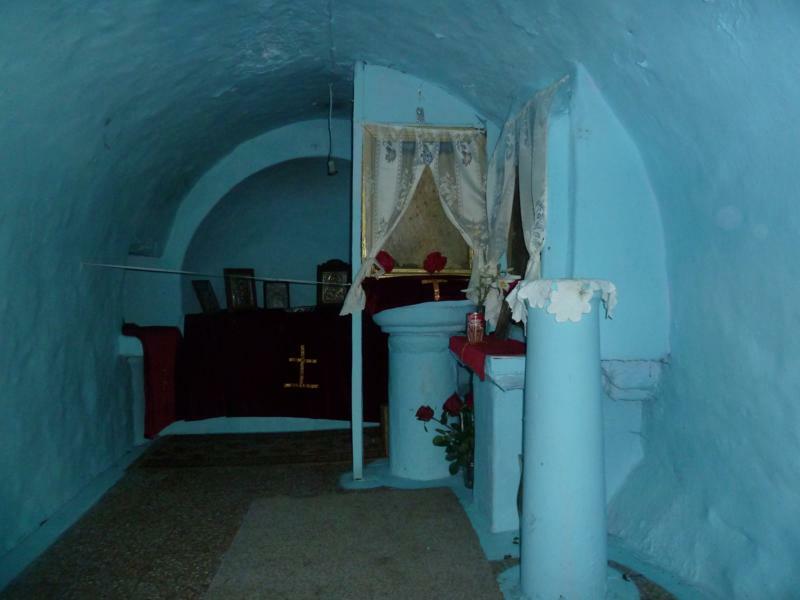 The Stavrou Timiou monastery is located two kilometers south of the quiet village Mavratzei, not far from Koumaradei. The monastery was founded in 1592 and it has been added to and enlarged both in the 17th century and the 19th century. There is a friendly courtyard with many flowers and plants and there is a church with blue domes. This three aisled basilica has a beautiful carved wooden iconostasis inside. The monastery is beautiful inside, but as usual again you are not allowed to take any pictures. Many wine grapes are grown in the surrounding of the nearby village of Mavratzei and just like in Koumaradei a lot of people manufacture all kins of pottery.